Brighten up your weekend with this pretty in pink Strawberry Rhubarb Mimosa, a seasonal spring twist on the classic brunch cocktail! April showers usually bring May flowers, but for this month’s Recipe ReDux, May will be bringing more showers – of the celebratory kind. Baby showers and bridal showers are blooming this time of year, as are graduation parties, retirement parties, weddings, Mother’s Day, and other occasions that are often celebrated with brunch. This month’s theme was Shower Brunch Season, for which we were asked to share our favorite healthy brunch dishes for the upcoming ‘shower season.’ There was a little reminder from fellow ReDux member and dietitian Jenna Braddock from Make Healthy Easy not to forget the shower cocktails/mocktails with fresh ingredients. So with that, I decided I was going to go the cocktail route rather than traditional brunch food. The mimosa is a very popular brunch cocktail traditionally composed of freshly squeezed orange juice and champagne, but I’m more of a fan of Prosecco (Italian sparkling wine) and there are more interesting fruit in season in spring than oranges. That’s how I decided to make this Strawberry Rhubarb Mimosa. Rhubarb is technically a vegetable, but because it is very tart and sour, it is most often combined with other fruits (most notably strawberries) and sweetened to be used in desserts. In fact, one of rhubarb’s nicknames is the “pie plant” because it is commonly used in pies and cobblers this time of year! Rhubarb looks like celery, but it generally has red stalks and green leaves attached – the leaves are toxic, so be sure to discard them. To complement the rhubarb I added strawberries, fresh ginger, and some lime juice to make my puree as the base of the mimosa. Just like a traditional mimosa, this one is brimming with vitamin C and antioxidants. If you have friends who don’t drink alcohol, pregnant moms-to-be, or if you want to make this a kid-friendly mocktail, you can easily swap seltzer for the Prosecco. 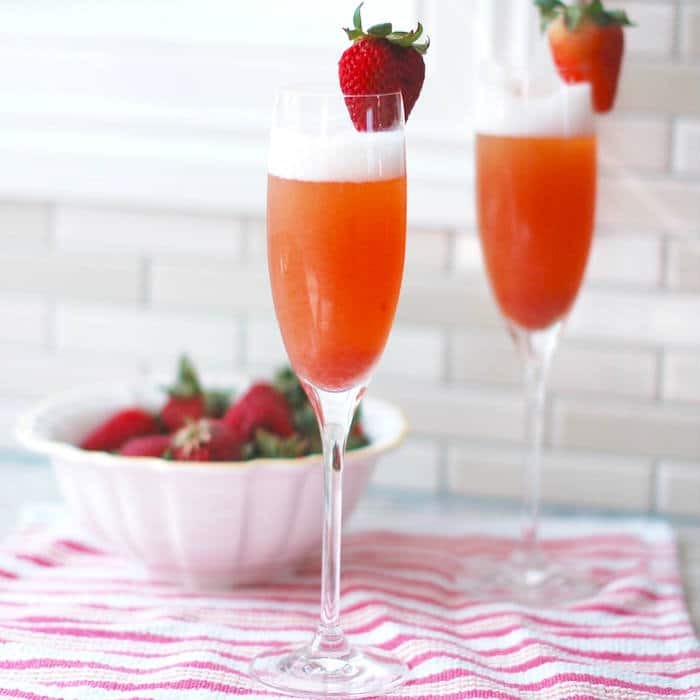 Whether you’re having friends over for a casual weekend brunch or toasting mom for Mother’s Day, this light and refreshing Strawberry Rhubarb Mimosa is the perfect beverage to serve. What are you waiting for? Go make yourself a drink! 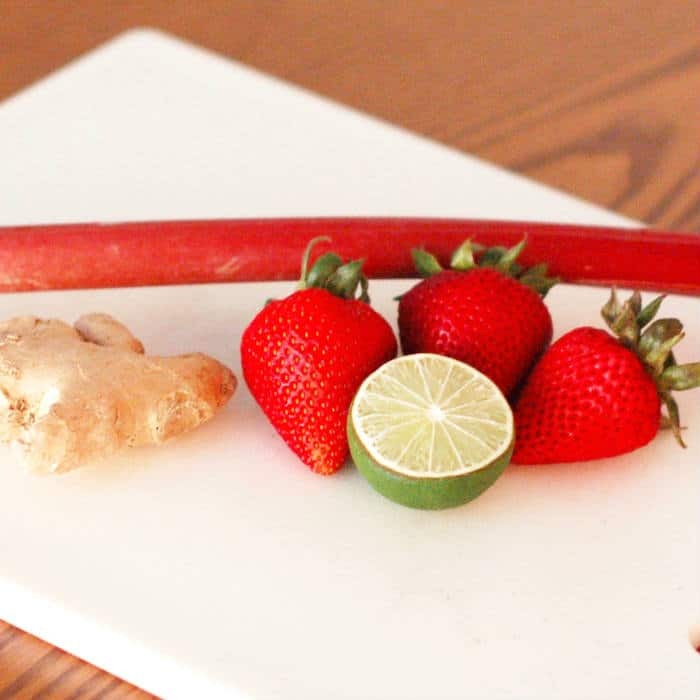 Combine the sugar, water, rhubarb, strawberries, and ginger in a small sauce pan. Bring to a boil and simmer for 10 to 15 minutes until everything is cooked down and the mixture is viscous, but not to the point of a jelly. Remove mixture from heat and let cool. Transfer strawberry rhubarb mixture to a food processor and add lime juice. (If mixture seems too thick, add 1 tablespoon hot water.) Puree mixture until smooth. Strain the puree to remove seeds. Add 1 tablespoon of the strawberry rhubarb mixture to each of four champagne flutes and top with Prosecco (or seltzer). Garnish with a strawberry and serve. What’s your favorite brunch cocktail? Thanks Regan! I am so proud of myself!! Thanks again for the awesome webinar and tips. I made it last night and re-took this morning so I would have the natural light- such a difference! This looks wonderful! And I love Prosecco too! I’ve actually never done anything with rhubarb before but this might need to change. Thanks Ann! I had never cooked with rhubarb either and have always been a little nervous too, but it was so easy to make the puree. Definitely give it a try! The puree can even be used as a jam, it is that good!! Lovely~I think this could become my new summer drink! I grew up eating rhubarb cobbler w/ rhubarb fresh from our garden, but haven’t had any in a long time. Love the addition of ginger too! Thanks EA! Wow, rhubarb fresh from the garden sounds amazing! Yes yes yes. Another vote for how this reminded me of fresh rhubarb from the garden growing up. And rhubarb pie… I would never ever have thought of a rhubarb Mamosa. 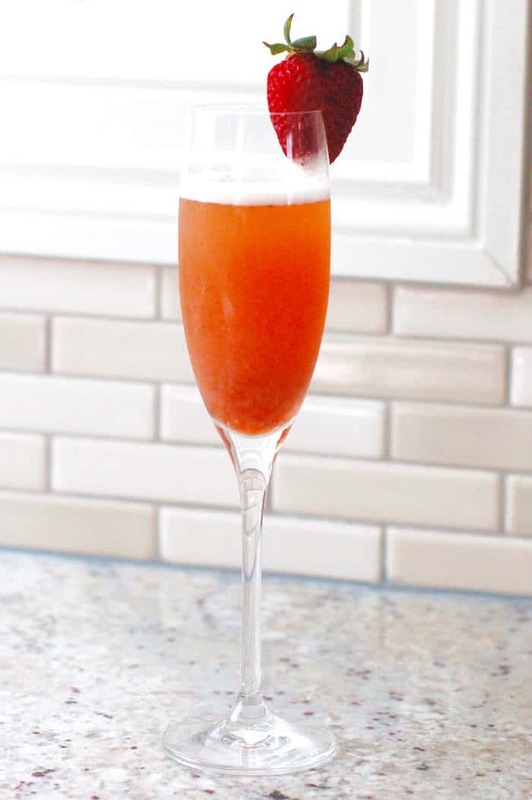 Now I need to gather a gaggle of friends and make this our official summer brunch drink!! I am so glad this brought back fond memories of rhubarb for you Carla! And I think that is a fantastic idea re: the official brunch drink of summer!! Thank you! Rhubarb is definitely an interesting ingredient to cook with. Let me know if you give it a try! Ok..this is not for me, but my wife is going to love this, cant wait to surprise her with it. Such a fun way to use rhubarb! I didn’t grow up eating it and so it kind of intimidates me…this recipe might be a great start! Rhubarb seems more intimidating than it is – it actually wasn’t so hard to work with and I was amazed at how quickly this tart “vegetable” became sweet and delicious! This looks fabulous! When I was a kid, I really didn’t like rhubarb even though we had so much in the garden. Now, I can’t get enough of strawberry and rhubarb, and I will definitely be trying this recipe! Oh la la! HUSBAND WOULD LOVE THIS!! I LOVE this idea for a mimosa…I’m not really a fan of orange juice, so this is a nice change. Plus it looks pretty too! I’m totally with you – I find OJ too acidic, especially with the sparkling wine. Hope you give this a try and enjoy! Uh oh, hope everything’s ok Abbey! Enjoy these! This looks so delicious and the perfect addition to brunch! This would be such a fun recipe for a bridal shower or a girls brunch! Definitely going to try it out soon. Absolutely 100%! Let me know how you like it Chrissy! YUM! This week has been crazy (how is it only Wednesday?!) so I’m thinking I’m going to need something like this on Saturday! Do it! You won’t be disappointed!! I LOVE this! Not sure if I will have rhubarb in time but if not I’ll get some! Mine is coming up and I don’t have any in the freezer. Thanks Alysa! It is quite delicious and refreshing! This looks amazing and perfect for a classy shower or get together! Thanks for sharing! Thanks Kristina! Definitely great for a shower – even baby showers since it’s so easy to make a mocktail version! These look beautiful and delicious! What a fun brunch idea! Thanks so much Whitney! Hope you enjoy if you get a chance to make one! Bring on summer! That little ginger zinger sounds like it would add nice little bite to and already refreshing sounding drink. Pinning these to make later for sure! Thanks Rebecca! I hope you enjoy it as much as I do! Bring on summer is right!! This looks so delicious! Can’t wait to give it a try! Thanks Denise. Hope you enjoy it! I love Rhubarb and this looks, sounds so delicious and refreshing! hanks Lauren! Hope you enjoy it!